WASHINGTON -- More than 238,000 of the 847,000 veterans with pending applications for health care through the Department of Veterans Affairs have already died, according to an internal VA document provided to The Huffington Post. Scott Davis, a program specialist at the VA's Health Eligibility Center in Atlanta and a past whistleblower on the VA's failings, provided HuffPost with an April 2015 report titled "Analysis of Death Services," which reviews the accuracy of the VA's veteran death records. The report was conducted by staffers in the VA Health Eligibility Center and the VA Office of Analytics. Flip to page 13 and you'll see some stark numbers. As of April, there were 847,822 veterans listed as pending for enrollment in VA health care. Of those, 238,657 are now deceased, meaning they died after they applied for, but never got, health care. While the number is large -- representing nearly a third of those listed as pending -- some of the applicants may have died years ago. The VA has no mechanism to purge the list of dead applicants, and some of those applying, according to VA spokeswoman Walinda West, likely never completed the application, yet remain on the pending list anyway. West said the VA electronic health record system has been in place since 1985, suggesting some of the data may be decades old and some of those people may have gone on to use other insurance. About 81 percent of veterans who come to the VA "have either Medicare, Medicaid, Tricare or some other private insurance," said West. "Consequently, some in pending status may have decided to use other options instead of completing their eligibility application." But Davis disputed West on every point. For starters, an incomplete application would never be listed as a pending application, he said. 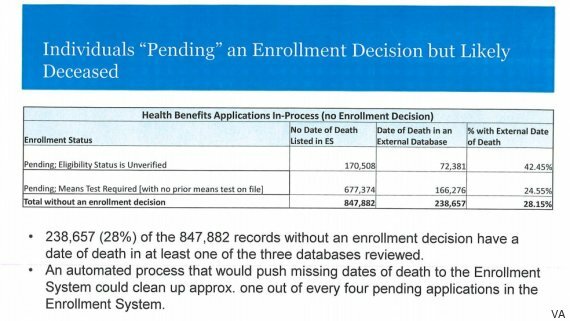 Beyond that, the health records system West is referring to is just that: general health records, not pending applications for enrollment in health care. The VA has only required enrollment in health care since 1998, he said, and there was no formal application process before that. Davis provided an internal VA chart that shows backlogged applications only beginning in 1998. As for some vets having other insurance, Davis said it is "immaterial and a farce" to suggest that means VA shouldn't be providing vets with the health care they earned. "VA wants you to believe, by virtue of people being able to get health care elsewhere, it's not a big deal. But VA is turning away tens of thousands of veterans eligible for health care," he said. "VA is making it cumbersome, and then saying, 'See? They didn't want it anyway.'" At a minimum, the high number of dead people on the pending list indicates a poor bookkeeping process that overstates the number of living applicants -- a number that should be closer to 610,000. This waiting list is unrelated to the VA backlog that made news last year, which left vets who already had coverage with extremely long wait times. VA press secretary Victoria Dillon told HuffPost the agency has made strides on that front, doubling the number of its appointments from 3.5 million to 7 million since last year. Davis sent copies of the report to House and Senate committees that oversee veterans affairs, and to the White House, hoping to spur congressional and presidential action to pressure VA to clear its health care backlog. A spokesman for the Senate Veterans Affairs Committee did not respond to a request for comment. Eric Hannel, the staff director of the House Veterans Affairs Subcommittee on Oversight and Investigations, said his team is looking into the report's findings. "We take it seriously," said Hannel. A White House spokesman did not respond to a request for comment. Davis recently sent a letter to Sen. Johnny Isakson (R-Ga.), who chairs the Senate Veterans Affairs Committee, laying out the problems with the health care backlog. He highlighted that 34,000 combat veterans are among those listed as pending for health care -- none of whom should be on that list since combat veterans are granted five years of guaranteed eligibility for VA health care. "They have no business being there," he said. "These are men and women who served in Iraq and Afghanistan." The best thing President Barack Obama can do, said Davis, is force the VA to allow veterans to upload their so-called DD-214 forms when they apply for health care. The form is a lifelong document that shows a person's military record. If veterans could use it to show their eligibility for health care, and if the VA assigned staff to review all of the pending applications, it would clear the logjam in the system, he said. "The White House has the ability to direct the VA to do this immediately," said Davis. "That would get rid of the pending eligibility issue." This story and its headline have been updated to clarify which VA backlog was revealed in the new document.